The latest trend in political campaigning is to pump sponsored adverts directly into your Facebook feed. But with the law struggling to catch up with the technology, who is keeping an eye on ‘dark ads’? Ten years ago political adverts were mass mediated: billboards plastered with an advert for every passerby to see, television ads anyone could tune into, and hundreds of thousands of identical leaflets posted across the UK. But now that’s all changing because of the internet and big data. Specifically, Facebook, and your data. Facebook controls an enormous data trove, gathered from analysing users’ page and post ‘likes’, message content, information such as where they live and relationship status, and behavioural interactions including where, when, and how long a person logs into the platform (and sometimes to other sites). This data is matched and modelled with other personal data Facebook has acquired, centrally from six main partners, an assortment of data-driven marketers and information analysis firms, including Acxiom, CCC Marketing, Epsilon, Experian, Oracle, and Quantium. The result is a rich data profile of every user, including assumptions such as whether they have private health insurance, their assumed net worth, inferred political positions or whether they’re citizens of the country they’re living in. Political parties can use Facebook’s platform in two main ways: using just Facebook’s data, or plugging in their own database and adding more data into the mix. Using the second method, databases of people can be matched by their phone number or email address with their online profile. In the case of Cambridge Analytica, an analytics and marketing firm, the plugged-in data can include 5,000-plus data points per user, including psychometric profiling. Advertisers can thus define specific audiences they would like to target – and then create dozens of iterations of an advert to see which work, abandoning unpopular adverts and pumping money into others. The ads do not appear on the poster’s Facebook page, only on the newsfeeds of those targeted. This opaqueness has earned them the name ‘dark ads’. What’s so bad about microtargeting? The issue with microtargeting is not just its claimed persuasive power, but the lack of transparency as to what is being said and seen. Dark ads present a unique affront to open democratic debate, as the political messages exist in a closed private space – a one-to-one relation on a computer or mobile device. False information can go unchallenged. Dark ads give political parties the opportunity to wear a thousand faces, as each party can present itself, and its messages, in dramatically different terms to different people. In some ways, this dynamic isn’t too dissimilar to doorstep canvassing, which was also done millions of times during the election. But there are important differences. Canvassing requires a person to volunteer to have a conversation, and the potential voter can shut the door if they want to. Online adverts are paid-for messages, where the promoter cannot be meaningfully challenged. Policy also seems to not been keeping up with technology. Paid-for political adverts on television are banned in the UK – party airtime instead is limited to predefined advert slots. But political videos are being published across the internet without limits or oversight. A further concern, the one that has drawn the Information Commissioner’s attention, is the control, collection and sharing of personal data. The risks of allowing the accumulation of such giant databases of personal data were made clear in June when a marketing firm contracted by the US Republican National Committee leaked more than a terabyte of personal data on nearly 200 million registered US voters. This included intimate details such as names, birth dates, phone numbers, addresses, political stances, and in some cases ethnicity. Finally, the extent and significance of spending on microtargeted adverts via social media is unclear. The Electoral Commission does not have a specific reporting category for how much parties spend on social media during elections, let alone information on targeting. And the use of intermediaries such as Cambridge Analytica further obscures the amounts directly spent on online adverts. Despite all these concerns, no one is really sure if dark ads are effective. It may be the case that agencies selling data and targeting services are overhyping the success of their services. There are oceans of variables which affect election results, so pinning electoral successes on just dark ads is not sensible. And while it’s likely that microtargeted advertising is more successful than untargeted advertising, it may still be less successful than a face-to-face conversation with canvasser. But then the ultimate power is when big data informs real world campaigning. This has apparently already happened in the US, and it’s only a matter of time before it happens here. The saving grace is that unlike dark ads, which just require money, volunteer forces require people who believe in something enough to show up and do something about it. The Cable partnered with the Bureau of Investigative Journalism to find out more. The recent election saw a crowdsourced attempt at shining a light on dark ads. Volunteers nationwide installed a browser extension – Who Targets Me? – which quietly tracks sponsored political adverts on their Facebook newsfeed. Partnering with the Bureau of Investigative Journalism, the word got about and thousands signed up to take part in the first systematic analysis of political ads on Facebook. In Bristol, 268 people installed the extension. Although our data-collection is far less sophisticated than Facebook’s, and our sample was heavily skewed towards young, left-leaning males in Bristol West, we did see a few interesting trends. With only our users’ age, constituency and gender, it was hard to see whether people were being targeted for these characteristics or because of Facebook’s other ‘under-the-hood’ data. We did see that ‘dementia tax’ ads from Labour and the Lib Dems were only seen by older people, with an average age of 54. And a Conservative advert warning Jeremy Corbyn would reduce defence spending was only spotted in Bristol North West, closest to the arms manufacturing hub of Filton. This graph shows whether the amount of advertising served to people’s Facebook feeds translated into a larger share of the vote. You can see that Labour put out a lot of ads, and did well in the results too. But the Greens and Lib Dems didn’t have nearly as much success with their advertising campaigns. It’s likely that people who installed the extension just aren’t highly targeted by the Conservatives, so their low views are a reflection of our sample rather than a lack of digital advertising. The Lib Dems were not just targeting voters, but also apparently EU citizens. Two unique adverts were seen – one stating: “If you agree that the UK government should GUARANTEE your right to stay in our country add your name today,” while the other said: “EU Citizens: You can’t vote on Thursday, but you can still make your voice heard.” Out of 152 unique adverts seen in Bristol, two thirds were seen only once or twice. This likely indicates some targeting was in play, as untargeted adverts would have a much more even distribution across our sample. As for ad content, we did see the offline trope of the politics of hope versus fear. Labour had a strong presence on social media throughout the campaign with 52% of ads taking a positive tone. 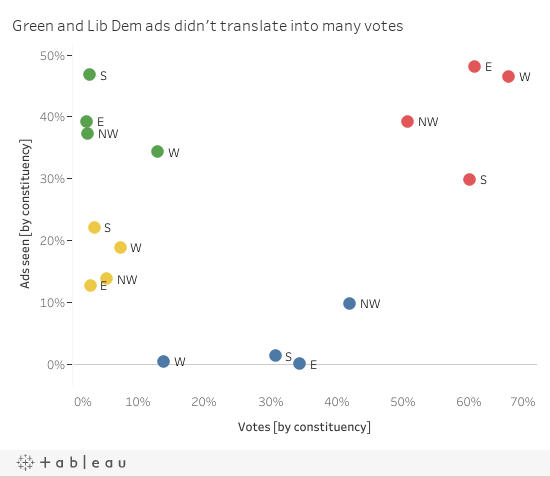 The Greens focused more on set-pieces, heavily investing in video-posts around Caroline Lucas speaking at the party leaders’ debate and taking a negative tone towards other parties in 54% of their ads. Our data-collectors were served few Conservative ads, but those they saw amassed huge numbers of views nationally, suggesting some generic ads were being served to people outside the Conservatives’ natural base. While the 2017 general election dark ads have proved hard to track, and it would be wrong to say they’ve had an overwhelming influence, they’re certainly an untested factor in our electoral calculations. At least now we know they exist, maybe next time we can dig a little deeper. Not necessarily. Some or all of them may have been pilot ads undergoing a ‘split test’ (RCT), found to be less effective than alternative ads (e.g. low click through or sharing rates), and subsequently discontinued for that reason. You’re right to suppose they weren’t necessarily targeted ads, which is why we were cautious in the wording around our assertion. What led us to thinking it was more likely they weren’t just split testing ads was the variety of adverts seen very few times. The adverts often appeared to be completely different, rather than tweaks and variations (you can have a look at this in the interactive by hovering the bubbles). Though there was certainly evidence of split testing and tweaking, I stand by the hypothesis that the low distribution rate of such a variety of adverts is evidence of targeting. Advertising is likely to be allowed in parks, with the possibility of billboards appearing in the future. Sign up to Who Targets Me, and help the Cable find out how political parties are targeting Bristolians on facebook. In Bristol and around the world, groups like Brandalism are using subversive tactics to confront outdoor advertising in our everyday life.